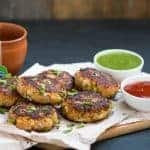 Aloo Paneer Tikkis are a delicious 5PM snack that is healthy, nutritious and the perfect street food recipe. Make this for the festive season or for the kids after they come back from school! It’s no secret that tikkis are as rooted in my North Indian soul as samosas and Thums Up. Chaat is always on the menu when I visit Raipur, but this Diwali, time flew away faster than those gol gappas at the local chaat waala. So I made these healthy aloo paneer tikkis to make do. It has been a long two weeks of first falling sick and living on khichdi and then making up for it by eating as many jalebis as I could without being called a glutton. Because my mum’s crisp, hot, super thin jalebis dunked in just enough chashni (thick sugar syrup) to not make them cloyingly sweet are the best in the world. So good that they’ve spoilt me for jalebis available outside. But this isn’t about jalebis. This is about these aloo paneer tikkis, which are perfect for the Diwali or the aftermath of it. Guys, I tried. I really did. To eat healthy as much as I could, and fought with myself to follow all of my 5 tips to eat healthy this festive season. But umm the jalebis are a once in a year affair and I fell quite hard for them. But you know my intentions are true and good. And these healthy aloo paneer tikkis are making me feel better. Because they are healthier. Not swimming in ghee, not fried and not as carb heavy. Am I doing tikkis a disservice? Let’s not think about that. I even stayed away from the Thumbs Up for this one, and served them with some Flavoured Lemon and Honey Tetley Green Tea instead. Because I’m all about the balancing act now. And a cup or two of green tea a day definitely makes me feel all refreshed and gives me my daily dose of antioxidants. Plus I’ve heard they have a few new flavours now. Citrus and Spice anyone? Or maybe some Cinnamon and Honey? I’ll take both please. With another batch of these healthy aloo paneer tikkis. I know I say healthy a lot. And you may be wondering how sometimes. I’m not so big on the no oil, no ghee, no sugar phenomenon. Umm except the Zero Oil Chicken Tikka Masala which is ummm so good it deserves a song dedicated to it! I’m planning to sing it. Okay don’t go away. I won’t. Convinced? Saaaay yesssss! Sprinkle with some chaat masala, and serve them with some tamarind chutney or a spicy pudina (mint) chutney for an added kick! Healthy north indian style aloo paneer tikkis are the perfect, easy appetizer for chilly evenings or when you have guests over! 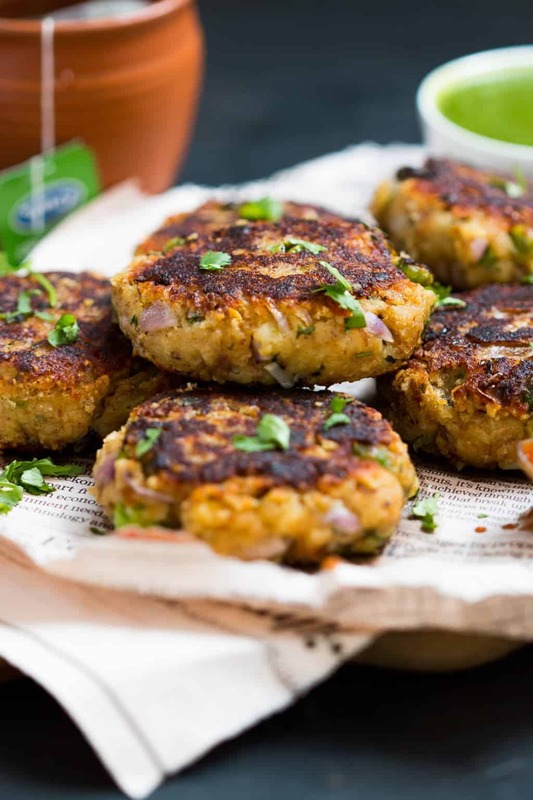 To begin making this Healthy Aloo Paneer Tikki Recipe, start by combining all the ingredients in a large mixing bowl, except the oil. Combine all the ingredients well, while mashing the green peas lightly with your hands as you mix. Check the salt and spice levels and adjust to suit your taste. Divide the mixture into equal size portions and shape them into 1/2 inch thick discs. Heat oil in a large skillet or pan and shallow fry the tikkis for 8-10 minutes on each side till golden brown and cooked through. Remove them from the pan and drain the excess oil on a kitchen paper towel. 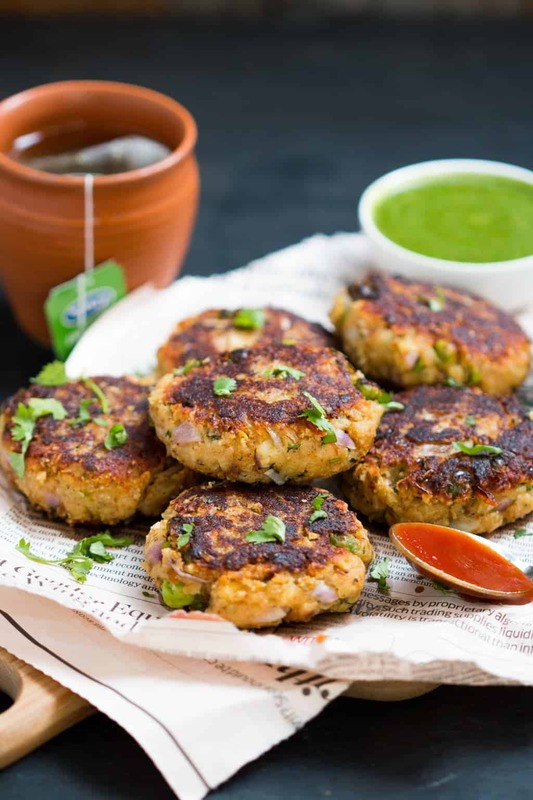 Sprinkle the tikkis with more chaat masala and chopped coriander, and serve hot with some spicy Pudina (Mint) Chutney and Tamarind Chutney or Ketchup. yuuuuuuummmmy! I want them, now!!!! I’m like you in the fact that I love to indulge in my “comfort” foods of my heritage! 🙂 These do sound amazing & so full of flavor! Wonderful combination of flavors — a great side with any meal. 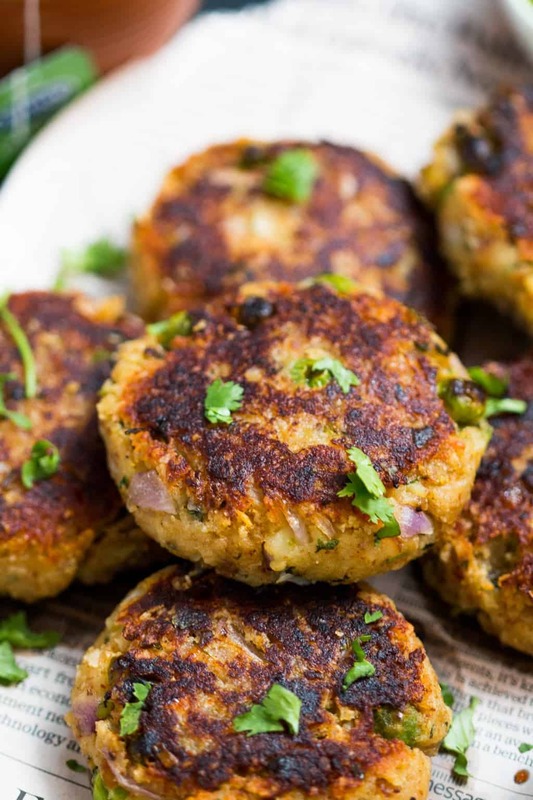 We will be dreaming of tikki tonight; very nicely done! So true Lydia, and everyone digs potatoes, plus they are so versatile! What a fun recipe. It’s interesting to me that so many cultures make some sort of potato cake, and why not? They’re well suited for holding all the ingredients and flavorings. These photos make me wanna reach into my screen and have some. Looks amazing ! Thanks Sara, they are a famous Indian street food! Oh I agree, jalebis are forever my favourite! The secret to binding is oats. I use oats to bind everything I make these days, and it works beautifully! You’re so funny with your jalebi story. Life’s to short to worry about them though so eat as many as you like. The tikkis look yummy!! I always have a hard time getting tikki like things to hold their shape. Good job doing that!